The Basics: The third installment of Marvel’s successful Iron Man franchise finds Tony Stark still haunted by the alien attack he helped fend off in The Avengers, throwing himself into the construction of Iron Man suit after Iron Man suit in a feeble attempt to keep his PTSD at bay. However, when the Mandarin, a terrorist waging war on the United States, brings destruction to Tony’s doorstep, he is forced to rely on only himself (and young Harley Keener) to protect those closest to him and the country as a whole. In the process, he confronts the question of whether or not Iron Man can be a hero outside of his suit. Iron Man 3 is the best of the franchise. Its action-packed moments were breathtaking, but the film was even more impressive in its quieter moments of character development. And, as always, it was anchored by a charming, funny, and surprisingly nuanced performance from Robert Downey Jr.
M.V.P. (Most Valuable Performer): Any superhero movie is only as good as its superhero. What’s made the Iron Man films stand out above almost any other in the genre is the easy charisma Downey lends to Tony Stark. His rapid-fire delivery and natural sense of “cool” make it impossible to see where actor ends and character begins, and that’s always been the selling point for this franchise. Downey was once again excellent in Iron Man 3, but the real strength of his performance was not in how cool he made Tony appear but in the exact opposite: the sense of barely-contained anxiety he brought to every scene. Yes, he was still brilliant in his smooth-talking, sharp-shooting moments of dialogue, but he was even better in the moments where he had to convey to us just how damaged Tony had become since the events of The Avengers. This time, his fast-paced delivery hinted not at a “too cool for school” attitude but instead at a crippling panic he’s trying to push down with every word spoken. In this film, Downey had to show more sides to Tony than ever before, and he proved himself more than up to the challenge. Scene Stealer: Child actors can often make or break a film. A bad one makes you roll your eyes or cringe with every line of dialogue, but a good one brings an energy to a film that only a child can bring. I think it’s safe to say that Ty Simpkins is one of the good ones. I would have never thought that the missing emotional piece in the Iron Man franchise was a little boy, but Simpkins’s performance added a warmth to Iron Man 3 that was absent in both the first and second films. His chemistry with Downey was incredible; the scene where Harley talked to Tony during one of his panic attacks was one of my favorite moments in the film. He was sweet but not cloyingly so, and his solid delivery was a strong match for the great things Downey can do with dialogue. Best of all, his presence in the film added another dimension to Tony as a character and brought out another side of Downey as an actor. The genuine bond between Tony and Harley was such a pleasant surprise, and it really helped make this the best Iron Man film yet. Bring the Tissues? I think you can leave the tissue box at home for this one. While there were plenty of strong emotional moments, there weren’t any that reduced me to tears. Should I Stay or Should I Go? Stay until after the credits are all over for a hilarious scene featuring one of my favorite members of the cast of The Avengers. It does nothing to tease future movies or enhance this one’s plot in any way, but the surprise cameo was probably one of my favorite parts of Iron Man 3. Most Memorable Scene: While Iron Man 3 was elevated above traditional “popcorn flick” status by its moments of serious character study, it was also an incredibly entertaining thrill ride—and in no scene was that more evident than in the film’s climatic action sequence. The moment when all of the Iron Man suits appeared on command was a gorgeously triumphant moment, and the action that followed was a breathless adrenaline rush. Coupled with the emotional stakes in the scene for Tony and Pepper, this was everything I love about big action movies rolled up into one incredibly fun scene. 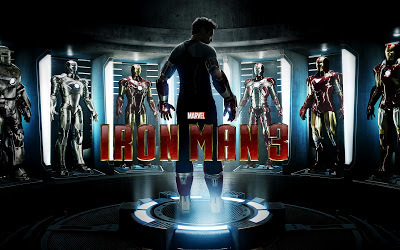 Strengths: The film’s biggest strength is Downey, and it succeeds above the others in the franchise because it gives him even more to do as an actor. His charm is known the world over, but what surprised me in this film is the way he made Tony’s anxiety, isolation, and ability to love feel as real and natural as his charisma. His panic attack scenes were genuinely affecting, and I love that this film gave us a long look at the broken humanity behind his cool exterior. What impressed me most about this film’s content is what continues to impress me about each Marvel film that comes out: the continuity and cohesion between each of the films in this universe. I love that these films don’t exist in a vacuum; what happens in each movie affects the action in subsequent movies. In Iron Man 3, I loved the callbacks to the events of The Avengers because they made so much sense for Tony as a character. To have him appear unaffected by almost dying during an alien invasion would be the height of unrealistic, but it would be forgiven because these films aren’t really supposed to be bastions of realistic cinema. Therefore, including references to what happened to Tony was not just a nice wink to Marvel fans; it made the film’s emotional core much more believable. Weaknesses: While I loved the Mandarin, I didn’t love Aldrich Killian and his story as much. There were parts of the regeneration science that confused me, and I didn’t care about Maya at all. I also think Don Cheadle got lost in the shuffle a little bit in this film. I love him as an actor, so I wanted more of his character this time around than what we got. And for as great as that final action sequence was, I think it could have been a little shorter. Sometimes too many big explosions and action-packed moments overwhelm my senses and dull my reactions to the spectacle, and that happened around the middle of that climatic sequence (but all was forgiven by the fantastic conclusion to that scene). Final Verdict: This was the perfect way to start what’s sure to be another excellent summer movie season. Iron Man 3 was filled with strong performances, great special effects, and surprising moments of emotion. It knew when to be serious, but it also knew when to be fun. That balance isn’t always an easy one to achieve, but this film managed to do so with the trademark ease of its title character. This entry was posted in Film, Nerdy Girl Goes to the Movies and tagged film, genre: superhero films, movie reviews, summer movie season by Katie. Bookmark the permalink.